In the past I've liked to shine a light on some of the great watch companies of the past that fell by the wayside during the quartz crisis. No company proved itself more interesting that Gallet, a once great manufacture of some of the greatest chronographs ever made. It is one of those chronographs that is currently up for auction on Ebay, the Gallet Flight Officer MultiChron. To say this watch has a history would be an understatement. Firstly the patented Clamshell case was the world's first water resistant chronograph case, beating other manufactures not by years but by decades. Rolex had secured the patent in 1926 for the now iconic screw-down Oyster case so Gallet were forced to use an entirely new system which they patented in 1937. Underneath each of the four lugs was a screw that secured the caseback to the case, sandwiching the lip of the specially designed crystal in-between. Two years later Senator and future President Harry S. Truman would come to the floor of the Senate to sponsor a bill to provide a chronograph for the pilots and navigators in the USAAF. Gallet was an obviously choice, not only because of the clamshell case back but because the exports of Gallet watches to the US were huge, close to 95% of their total production. The watch Gallet made was the Flight Officer, the first watch that could show the wearer multiple time zones by using a rotating bezel. I'm not 100% certain but from all the research I can find, it appears to me that Truman's own personal Flight Officer marks the first time a President ever wore a chronograph. Truman also wore a Universal Geneve Tri-Compax whilst signing the Potsdam Agreement however as he was familiar with Gallet through his senate work that he would have got one before becoming President. 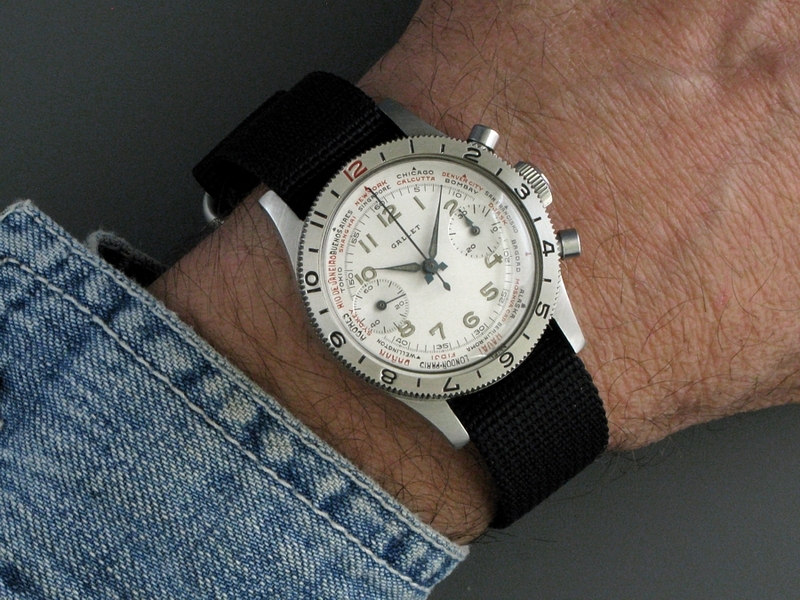 Truman wore one other famous watch which I'll be talking about next week. This Flight Officer for sale is dated to right after 1944. The Ordnance Department markings on the caseback were only used up until 1945 and Gallet have commented on the lot to say that serial numbers confirm this date. Another tell-tale sign that this is an earlier model are the 'alpha' hands which replaced the earlier diamond style. The single color dial was also beginning to be used around this time as well.The white dial is something really beautiful and is a perfect example of how to design a complication that is not only useful but appealing to look at. The movement is a Venus 150 which was modified by Gallet for increased accuracy. The seller says that the watch still maintains chronometer level accuracy (+/- 3 seconds) over a twenty-four hour period with a maximum deviation of only six seconds in a crown right position. Just by the regulator you'll see the importer mark of JxR for Jules Racine. Racine was the sole importers of Gallet to the United States and handled the majority of their government contracts. Jules was not only the cousin to Leon Gallet but was also cousin to Ariste Racine, founder of Enicar. At 34.5mm its a small watch but frankly it's so good looking I don't care. The watch comes with a black canvas NATO strap but I can see it looking good on a leather NATO or grey suede strap. The seller of the watch actually used to work for Gallet and acquired it during her time there. At some point the watch received a "Museum style restoration" a few years back. I'm not sure what that restoration encompassed as the description of the watch says that the case and lugs have remained unpolished. It could have been just the movement which again appears to be in near perfect condition. When it comes to something like this, especially with a piece of this age, it's best to contact the seller with any questions you have. I'm a writer, not a dealer so please do your due diligence before bidding. At the time of writing the watch has just under three days left and is currently $2950. Click here to go directly to the lot.